Riviera Holdings Corp, the company that owns the bankrupt Riviera casino hotel on the Las Vegas Strip, recently released its annual report. The company had a rough year, and a look at the financial reports from the last few years sheds some light on why the casino's in such trouble, and why the Sahara is closing. As you can see, net revenues have fallen dramatically--by almost 48% since 2007. Partially, that's because the increases in ADR in the middle of the decade were not sustainable with the current amount of supply on the market. The recession's certainly the primary reason for the hotel's decline, as with room rates falling everywhere, it's not realistic to expect anyone to pay more than $80 a night for a room at the Riviera. The decline in casino revenues (down 41% since 2007, the first year for which data was available) is just as remarkable. There have been some experiments at the Riviera, with the number of slot machines dramatically reduced, that probably haven't helped results, but the bottom line is that gamblers just aren't gambling as much money--particularly the more value-driven customer that the Riviera attracts. The drop in F&B revenues might be a little deceiving; over the past few years, there's been a shift to lease out more outlets, so the money spent there doesn't end up on the Riviera's balance sheet. The entire food court, for example, is leased, as is the Banana Leaf and Queen Victoria Pub. But there's still no way to positively spin this; a casino that's been around since 1955 is at what may be unprecedented levels of unprofitability. The scary entertainment decline is due to shows being closed and ticket prices being reduced for those that remain. 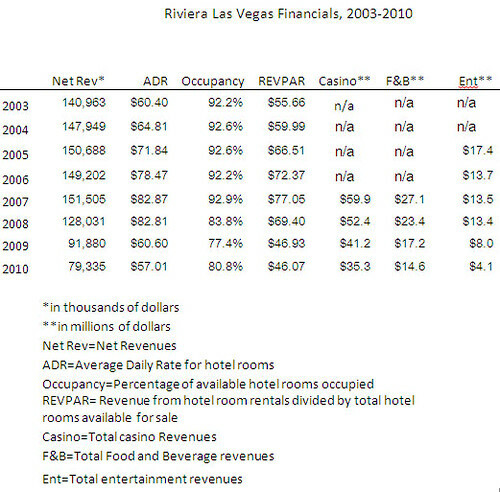 Looking at the trends in that chart above should give you a good idea why the Sahara's closing; they don't have the Riviera's convention center, which has somewhat helped the Riv to hold onto a base of customers, even though they've had to drop prices across the board to do so. Make no mistake--things are pretty dire on the North Strip right now. With Barry Sternlicht and other investors buying the bankrupt Riviera, the hotel isn't in danger of closing anytime soon. It will be interesting to see what kind of changes Sternlicht makes. I would guess that if he can restructure the debt obligations and otherwise keep expenses down, he's got a good chance of surviving. The interesting thing is that, despite the perception of the Riviera as an aging, decrepit wreck of a hotel, most of its rooms were last renovated in 2008; about 300 rooms in the Monte Carlo tower were renovated in 2005, so it's not like a Tropicana or Stratosphere-style room refreshing is in the cards. Sternlicht has says the focus will be on retooling the public areas, and that seems to be the best bet. In general, though, things don't look good for the North Strip right now. That explains my comments on 8 News Now this morning about the Fontainelbleau being a "beached whale" on the North Strip. The tide certainly has gone out. If you want to pore through the 2010 10-K, yourself, here is the link. That end of the strip is definitely a waste land. It doesn't help that walking it at night is not the most pleasant experience. I do wonder if they might consider treating the property almost like a local's joint on the strip to see what could happen. I have to believe they have to think far outside of the box when it comes to bringing in people, as it's a difficult sell to the average tourist and with the Sahara closing it's even worse. Really nice analysis. It would be interesting to plot out financial profiles on how properties perform over their lifespan. I wonder if there is a "standard" profile and what kind of return can be expected on refurbishments. Surprisingly, I think that without the huge debt burdens, most properties would have weathered the recession and new room inventory without much difficulty. The survivors seem to be those that were able to shed debt (Trop, Strat, Riv) - although most often through bankruptcy. Stratosphere appears to be doing ok on the north end with refurbed rooms and a clean casino. I'm sure MGM would like to ditch Circus as soon as possible. Although it is packed, I'm not sure Circus makes money anymore. The Riviera would still be in jeopardy if Circus closed. As for FB, it is anyone's guess. I'm doing those charts by taking my Excel charts, copying them into Word, taking a screenshot, pasting it into Photoshop, cropping it, then uploading it to Flickr. Anyone know an easier way to get a chart in Excel online? I'm sure that tourists rarely venture down to that end of the strip, unless they have an existing relationship with that property or properties in the vicinity, so trying to go for a more "locals" vibe seems like a logical next step. However, the locals can go to a Station casino, like Sunset Station or GV Ranch which is MUCH nicer and not on the strip. I remember when I lived in Vegas we never ventured down to the strip unless company came in from out of town. And even then, we stuck by the Biggies, like MGM/Bellagio/NYNY/Wynn, etc... With the end of the Sahara in sight, the Riviera is probably in quite a bit of danger of following the same unfortunate end. Dave, if you can print to PDF (built in on OS X, or if you have full Acrobat on Windows) you can create a PDF of your chart from Excel. Then open that with Photoshop and resave as GIF or JPG. I visit the RIv when we stay at the Hilton as it is a pleasant walk in the morning and there are two machines that I love to play. Yes, I have noticed a reduction in the number of machines and the number of early morning people. On the other hand, the casino appears clean (certainly cleaner than the Sahara) and somewhat inviting (compared to the facade of Circus Circus across the road). However there is evidence that the stores that used to line the convention entrance where I enter from the Hilton have closed. Oddly enough it appears to be the only viable option to play at that end of the strip. The best of a bad lot. MGM probably isn't looking to jettison Circus Circus at all: It comes with a great deal of land that, in an improved economy, would be ripe for redevelopment and much of which is currently underutilized. Also, with the Sahara out of commission, what nearby property stands to benefit? Circus Circus, which inhabits the bargain, family-friendly niche. Besides, which casino operator now has access to the SBE database? Circus Circus owner MGM. It wouldn't surprise me in the slightest if closing the Sahara were either a precondition or at least an incentive in the recent SBE/MGM joint-marketing deal. Regarding: "closing the Sahara were either a precondition or at least an incentive in the recent SBE/MGM joint-marketing deal"
I doubt it. The idea of a "rising tide floating all boats" is more important than killing off competition. Dark casinos make that end of the strip even creepier. I suspect that you will see Circus Circus revenue drop even further. I think CC was saved because Ceasars Corp. raised their "buffet of buffets" price to $45. Otherwise budget minded families would stay at CC and buy the buffet and spend all day in those properties. Personally, I think "Winchester NV" should take it's 4.5 sq miles and join the City of Las Vegas, and move the city limits from Sahara Rd to Desert Inn Rd. It seems ridiculous that CLV should be using it's tax dollars to try and get an arena and other improvements downtown, when they are trying to do the exact same thing 2 miles away in Winchester. Dave: have you tried File > Save As, and then choose "Web Page" as the Save As type?